There is a sweet spot in the market where your organization, and only your organization, can outperform the competition thanks to your unique combination of capabilities. The purpose of Innovation 360 framework is to locate each organization’s individual sweet spot by helping them define their areas of excellence and identify obstacles, so they can answer customer’s problems with original solutions. 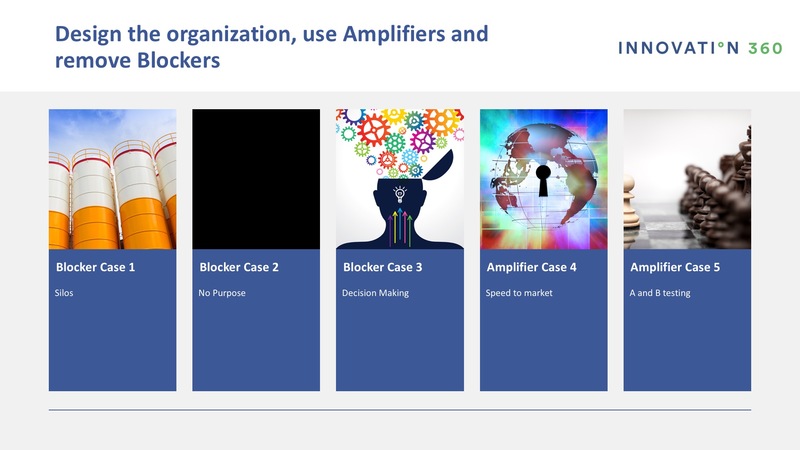 Over the years, we’ve encountered many businesses where excellent ideas were muffled by internal innovation blockers, yet many of these same businesses didn’t take advantage of hidden amplifiers in the organization that could have helped them be heard above the noise with greater volume and clarity. Every innovation project begins with a series of design choices, but each of these choices has implications for the sort of blocks you can expect to encounter along the path. The best practices that we’ve developed indicate that the very first choice you make should be to select a strategic objective for the innovation project — one that is directly linked to the growth strategy of the organizations leadership. Teams who make a mistake here and select a strategic objective based on other criteria tend to lose the support of innovation champions at the leadership level and the engagement of coworkers at the implementation level. Alignment with business-critical performance metrics prevents the innovation team from being treated like a “black box” that has little relation to or significance for the rest of the organization. Innovation is inherently problematic for many workers who are comfortable with the way things are or fear what the change will cost them in the future. Inertia and mistrust are at the heart of the three most common blockers we have encountered. On the positive side, there are many inside the organization who may already be well experienced and skilled with two of the essential amplification skills that are key to making innovations come to life in the real world: getting to market quickly and improving customer response with A/B testing. The history of business can been characterized as a war between generalization and specialization. The first industrial revolution came brought assembly lines where difficult tasks were broken down into areas of specialization that greatly increased the speed of production. That division of labor also created silos of knowledge that carried over into the information economy. Today people working within specialized departments still compete with each other, getting in the way of cross-functional collaboration. Motivation and productivity go hand in hand. When workers are not engaged, or actively disengaged, they tend to make bad decisions from the standpoint of the business. They don’t see innovation as important or valuable because it means doing things in a new way, which does not align with their priorities. Or they simply are not inspired because they don’t see the larger picture. Articulating a clear purpose and creating a culture that support and rewards innovation will engage stakeholders meaningfully in the process. Even if workers are engaged and want to help the company move in a new direction, there is often no methodology present in the business to give these workers the freedom to conducted experiments based on working hypotheses and access the data that would support their decisions. They simply don’t have the tools to important decisions like these without several layers of approval. In an agile, rapidly changing world, the window of opportunity may be closed long before the decision works its way through the chain of command. For these companies, there is no possibility of working on Second Horizon innovations where there are a great deal of unknowns that require solid battery of testing. These workers can only pursue small improvements, which are too little, too late to keep up with competition in a turbulent market. On the positive side, successful innovation teams frequently find that they have a secret weapon hidden away in another part of the organization. Some departments or groups in the organization may be highly skilled and experienced at moving products to market with minimal delay. It might not be obvious at first, so it takes internal investigative work to find these amplifiers scattered across different sectors. Once you find them, however, you still need to engage them to align with the mission and goals of the implementation team. Another essential component of the innovation process is the option testing and validation process. Fortunately, marketing teams have often highly skilled at the practical application of A/B testing tools and technologies. They will be your best allies in the commercialization of the innovation, so involve them as early as possible in the process. Successful innovators do a few things very well. They are able to design an innovation project in line with top level strategic goals. They reach out to build consensus across silos. They inspire and motivate teams with vivid visions of how the innovation will impact lives. They work to empower the implementation team so they take ownership and responsibility for the success of the project. Most of all they stay dedicated to the cause no matter how many blockers they need to go around. When they do, they find pockets of talent and skill inside the organization that can help them amplify their messages and connect more closely with customers. Sweet spots in any market are fluid, moving in response to customer demand, competitive pressure and large-scale industry drivers. Successful innovators learn to move along with the sweet spot, adapting their way along riding waves of innovation to a long-lasting market advantage.